This June, NYC is where you'll want to be. The music industry's most powerful players will converge in New York for the New Music Seminar, sharing their thoughts on the future of the digital medium alongside performances by some of the up-and-coming stars of the movement. OurStage will be hosting a showcase at Arlene's Grocery with five bands that our community of music lovers has decided need to be heard. You could be one of those bands. Upload your best track right here before May 8, 2012 and we'll let our fans judge who deserves the spotlight. If that's you, you'll get to perform for the people who are shaping the way we hear music, including OurStage, Pandora, Spotify, Google, Apple, and Facebook. Ready to take your game to the next level? We thought so. Your journey to the big time begins here. Participants must be eighteen (18) years of age or older at time of entry and must reside within the forty-eight (48) contiguous United States. 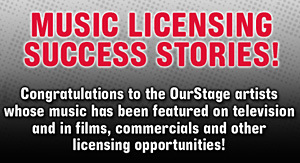 Only submission materials that are determined, at the sole discretion of the Sponsors, to be classified as Pop, Rock , Hip-Hop, Alternative Hip-Hop, Rap and R&B as defined on the OurStage FAQ's will be deemed valid entries.